A gin and tonic with a bottle of Bluecoat Elderflower Gin. For four days this weekend, the top floor of Philadelphia Distilling in Fishtown will transform into an enchanted garden filled with moss, ferns, and craft gin cocktails made with edible flowers. The pop-up, which opens Thursday, is called “The Betsy,” for Betsy Ross. It’s celebrating the national release of the company’s Bluecoat Elderflower Gin by featuring the spirit in bright, springtime cocktails like an elderflower spritz, which also contains clementine aperitif, blanc vermouth, sparkling cider and an edible rose garnish; and a Betsy Ross, with simple syrup, lemon juice and muddled strawberries. 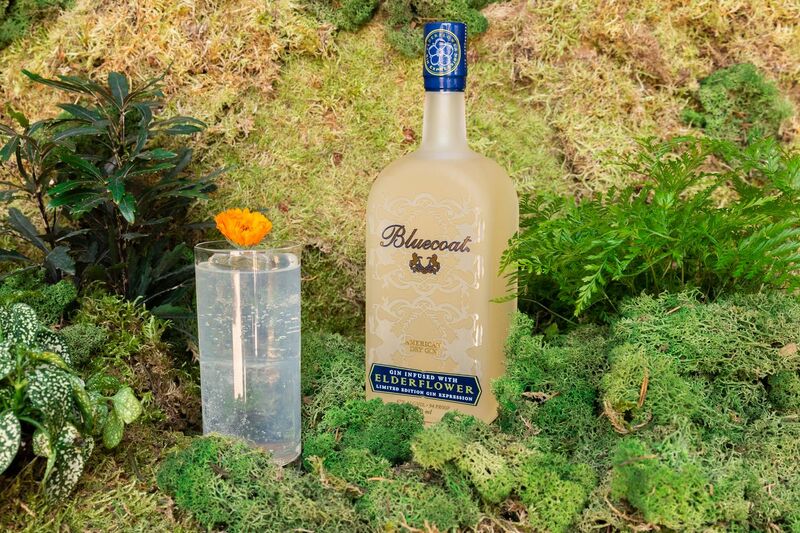 Bluecoat Elderflower Gin was released locally last May at the distillery. Visitors will ride a moss-covered elevator to get to the installation, which company representatives said will be decorated with more than 1,200 branches of ferns, greens and florals, about 160 pounds of moss and more than 40 different types of plants. The Betsy is open at Philadelphia Distilling at 25 E. Allen St. on Thursday and Friday from 4 to 11 p.m., and Saturday and Sunday from 1 to 11 p.m.